This beautiful tree makes a striking impression in spring when it is in full flower and is a good choice for a shade tree or focal point in a garden with sufficient space. Olinia ventosa is an evergreen forest tree of between 10-20 m in height. In optimal conditions it is found as a large, shapely, many branched, leafy tree with a spreading crown, but when growing on an exposed hillside it is a medium-sized tree or large shrub. In older trees the trunk is often fluted and gnarled. 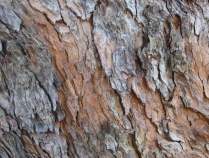 The bark is thin, greyish and smooth on young trees, but as the tree begins to age, it becomes very rough and scaly with an ochre to reddish tinge. The leaves are ovate to elliptic, 35-80 x 18-35 mm, glossy dark green above and pale green below, margin entire, occurring in opposite pairs. Young twigs display a distinctive four-angled pattern. Crushed leaves, twigs, bark and freshly cut wood all smell strongly of almonds. The tiny white to pale pink flowers are borne in dense axillary clusters of up to 60 mm long and are faintly sweet-scented. 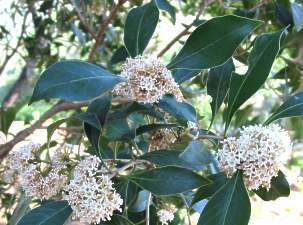 The tree is very attractive when in flower, as the flowers stand out very well against the glossy dark green leaves. The flowers appear in spring, from August to October. The berry-like fruits are coral pink to bright red when ripe with a distinctive, round scar at the tip; about 10 mm in diameter. The fruits have a hard, woody centre containing several small seeds. According to Palmer & Pitman (1961), Olinia ventosa does not bear fruit regularly, sometimes only once every 5-7 years. Olinia ventosa is not a threatened species, but nevertheless is a very important component of any forest system where it occurs. Olinia ventosa is found in forests and forest margins, as well as coastal scrub and rocky hillsides, usually at low altitudes. It mainly occurs along the southern and eastern coastal regions of South Africa, from the Cape Peninsula to just above the borders of the Transkei into southern KwaZulu-Natal. There are many very beautiful specimens growing in the forests on the eastern slopes of Table Mountain above Kirstenbosch and in Newlands Forest. The early colonists called this tree the hard pear/ hardepeer, and also extended this vernacular name to other species of the genus, namely Olinia acuminata, O. radiata and O . emarginata, also to Pleurostylia capensis and Canthium inerme. The Xhosa name umngenalahla means, tree that is without embers or charcoal, i.e. a tree that does not make good firewood. The genus Olinia was founded by Thunberg in 1799 and is named after the Swedish botanist Johan Hendrik Olin, 1764-1824. Its former species name cymosa means bearing cymes and refers to the cymose flowerheads. The current name ventosa means light as or fast as the wind, windy or swift, from the Latin root ventos, perhaps referring to it being one of the fastest growing indigenous forest trees. The family Oliniaceae contains only this genus, which consists of 8-10 species that occur in eastern and southern Africa . In southern Africa there are six species: Olinia capensis, O. emarginata, O. micrantha, O. radiata, O. rochetiana and O. ventosa. This species was previous known as Olinia cymosa (L.) Thunb. The nectar in the flowers attracts various insects and birds that act as pollinators. 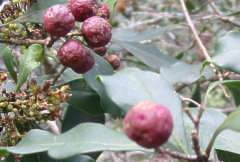 The fruits are eaten by fruit-eating birds such as louries, bush doves and mousebirds and this aids in seed dispersal. 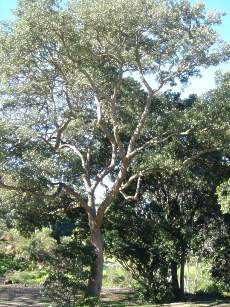 Foresters regard this tree as a forerunner of forest, not a true pioneer like the keurboom ( Virgilia oroboides ) but characteristic of the secondary stage that takes over when the pioneers begin to die off. It is one of the fastest growing indigenous forest trees, under forest conditions. The wood of Olinia ventosa is hard, heavy and strong and was used for fencing posts, telegraph poles, wagon building and even musical instruments in the past. Today it is mainly used for fine furniture-making, as it has a beautiful yellow brown finish, comparable to walnut. Olinia ventosa is a most attractive evergreen shade tree for the larger to medium-sized garden. It is very hardy and able to tolerate poor and stony soils. As with most trees, it should not be planted too close to buildings or paved areas. The seed is difficult to germinate as it has a very tough coating that first needs to rot away. Once germinated however, the young plants grow very rapidly. Sow seed in spring into a 10 cm deep tray. Use a general soil mix of 2 parts clean sand : 1 part loam : 1 part well-rotted compost. Cover the seeds with a fine layer of clean sand. The tray should be kept moist, in a warm, sheltered area where there is light shade. As the seeds take long to germinate, water the tray with an anti-fungicide to prevent fungal infections. Once the seedlings have developed sufficiently, pot them out into larger containers or into the garden if they have developed a healthy root system. Protect young seedlings from frost. Coates Palgrave, K. 1984. Trees of southern Africa . Struik, Cape Town . Palmer, E. & Pitman, N. 1961. Trees of southern Africa . Balkema, Amsterdam , Cape Town . Jackson , W.P.U. 1990. Origins and meanings of names of South African plant genera . University of Cape Town Printng Department. Leistner, O.A. (ed.). 2000. Seed plants of southern Africa : families and genera. Strelitzia 10. National Botanical Institute, Pretoria . Van Wyk, A.E. (Braam) & Van Wyk, P. 1997. 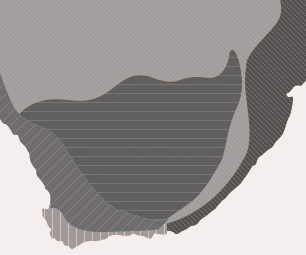 Field guide to trees of southern Africa . Struik, Pretoria . Van Wyk, A.E. (Braam) & Van Wyk, P. 2000. Trees of southern Africa . Briza Publications, Pretoria .